Winter is the perfect time of the year to plan your next home improvement project or, better yet, start your next home improvement project. During the frigid winter months, bears are not the only ones who go into hibernation. Homeowners tend to put their projects on the backburner as they snuggle in their Snuggies and try to think happy (warm) thoughts until spring. So what does this mean for you? Why do you care what everyone else is doing during the winter? Well, while most homeowners are busy day dreaming about warm, sunny beaches and outdoor barbeques, most contractors are left with more than a few openings in their calendars. According to the experts, September-March is best time to have your new deck installed, when demand is low and fencing companies have more time to dedicate to you and your project. So what are you waiting for? The average ROI (return on investment) of a new deck is 72%. This means you can expect to recoup $0.72 for every dollar spent on your new deck when you sell your home. Of course, this is not always the case, it is just the average. Have you been itching to entertain, but you just don’t have the space, especially the outdoor space? Well, a deck is the perfect venue for your next cookout, birthday party, or dinner with your family. A deck is an especially useful addition if your home is situated on a hill. A new deck will help you reclaim your yard and allow you to finally utilize your outdoor space like you have always wanted. Adding a deck can make your home more visually appealing and enhance its overall quality. 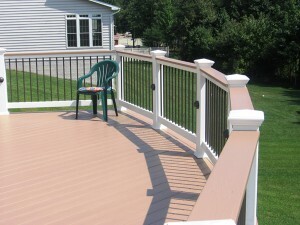 A new deck addition can take less than a week to be completed, and it is much more affordable than you probably think. And, if you have your new deck built this winter, it will be ready when spring finally…well, springs! If you have any questions about Deck construction, please contact Mid Atlantic Deck & Fence (MAD Fence) today by clicking here or calling 1-800-833-9310. We proudly serve Anne Arundel, Baltimore, Howard, Montgomery and surrounding counties.